Thank you very much for your positive feedback on search filters. We are pleased that you enjoy this feature. Additionally, your emails have inspired us to add new search filters. 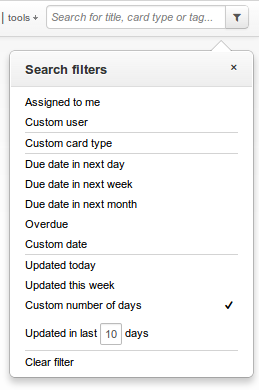 Now you can filter cards by the update time: updated today, updated this week or updated in custom number of days. Remember that your feedback is valuable for us. Your suggestions make Kanban Tool better.